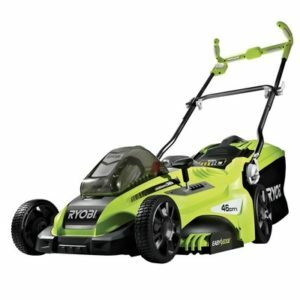 Introducing the RYOBI 36V Mower. It delivers clean, reliable, exhaust-free performance to get the job done quickly and quietly. Experience a new level of performance with the freedom and convenience of Lithium-ion power. The on-board battery status indicator help the user monitor battery level during use. Easily adjust the cutting depth with the 5-position single point height adjustment lever. Choose between two discharge functions, mulch or bag your grass trimmings. When you are done with your trimming task, use the quick release handle and collapse the unit for compact storage in your garage or shed.